Can there be too many courses? Or do I just need to keep learning stuff? I wonder: is it a sign of confidence or insecurity that I keep taking courses? No matter the reason, I have signed up for (yet another) on-line course over at Big Picture Scrapbooking. I have long been a fan of Creative Therapy. Though I often read, and contemplate, the catalysts, I don't often put pen to paper, or fingers to keypad, in order to participate. As it turns out, the brilliant woman, Karen Grunberg, the catalyst for Creative Therapy is reprising her class: Telling Stories Deeply. How could I resist? There are a few more days to sign up and join in. I signed up "late" and am currently playing catch-up with the message board and assignments. It's worth every minute of it. Oh, and added bonus? When you sign up for the course, you can download the self-paced Change In Plans course for free! Are you in the class? Let me know! During my morning journey through my google reader I was delighted to happen upon a link I found on write. click. scrapbook. where Celeste is the host this week. Like me, she lives with lists in order to carve out some time to craft, you know the saying about life getting getting in the way of our plans! 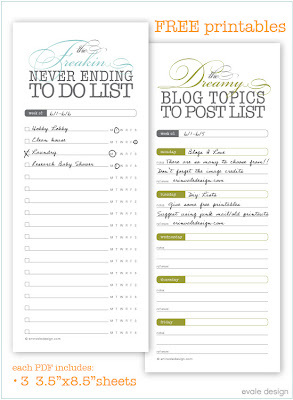 Anyway, the link is to the most gorgeous lists! Who wouldn't want one entitled The Freaking Never Ending To Do List? Then I went on to explore the Vale Design blog even further and I have to tell you, Erin Vale is incredibly talented! I've added her to my full-to-bursting reader and look forward to her future posts ... and I'm thinking about making that peach cobbler tonight for dessert! I am a fan of Donna Downey for a few reasons. Primarily, I like her work because she is immensely talented and fearless, she tries things that would never occur to me. Where I am linear she is all over the place! I admire her ability to create with abandon. With utter joy. On the flip side she is absolutely determined, driven to be better: her recent weight loss and running challenges have been nothing short of inspirational. I was on the waiting list for her recent retreat. Since I was on the waiting list, I did not budget to go on the trip, so when I got the note that I had "made it" I had to pass. $2,000US + the cost of food and accommodations was a bit steep on very little notice. I almost wavered when I found out the brilliant Cathy Zielske was going to be a teaching assistant (!!) but practicality won. she got me with her very first line: "each wednesday i will be inviting you to take a chance; try something new and stretch yourself creatively, personally or simply experiment." So, though most of Donna's mixed media creations are completely out of my comfort zone, they are the kind of art I greatly admire. I love her work, Christine Mason Miller's work, Sherry Sundlie's work, Emily Falconbridge's work, there are so many talented and fearless women out there to admire! My plan is to join in and see what happens. Check out the post. Maybe you want to join in, too? If so, let me know, I love looking at the work of other people! The brilliant and innovative Ali Edwards has started Tuesday Tutorials on her blog. She is kicking her new series off with a tutorial by Jennifer McGuire. I'm all about learning new things. I'm even more all about learning new things with stuff I already have. Go over and check it out! A brand new site launches today. I am incredibly thrilled! If you, like me, were a reader of the late great Simple Scrapbooks magazine, you will recognize a number of members included in this inspiration collective. Head on over and read about this group's beliefs. There is already a June Gallery of layouts. I'm thrilled to see this site and so many designers who I have been following for ages. Head on over to write.click.scrapbook, today! I am excited to dig into it, use the fabulous to-be-posted JustCre8 sketches: check out these from April, and participate in Lain's LOAD challenge. You can find the complete Projects Now offering: here. I am, absolutely, a scrapbook supply junkie. LOVE all the papers and embellishments. That, combined with the thrill of receiving mail, has me looking for a monthly scrapbook kit to order. This has been quite the exploration: I've been on this search for over a year. I think I've finally found the two perfect for me. They have new product, great ideas, fabulous support and the prices are very good. My favourite (this month) is Just Cre8, a Canadian scrapbook community - Sue has fantastic product and I'm thrilled to have an opportunity to support a local business. The other is from the States, Two Spotted Dogs (pictured above) where Diane is so easy to deal with and doesn't "pad" the shipping. Though I do spend a lot on my scrapbook materials, I do so with a sense of value. Rarely do I buy something just to have it - or worse, collect it! Both of these resources have current product, great prices and offer value. The best part? I want to use up the first kit before the second arrives so I'm ... gasp ... getting pages DONE! And, what can be better than that? I really have to stop thinking I can't do things, but I really find the whole Photoshop experience intimidating. I can do some things, I've taken enough classes, and I'm pretty good through the courses, but I am unable to self start. I can't really seem to get my brain wrapped around the whole thing. But I'm signed up for a bunch of blogs ... to torture myself with their ideas and creativity. So, today I was going through my neglected Google Reader to find on Inspiration Links for Artists a link to Design Reviver only to find SWIRLS, CURLS and FLEURONS, my most favourite digital design element. Even better? They're free. I love looking at different scrap spaces. Mine is always evolving and changing as my scrapbook needs change. Some day I would love to have a bright, spacious, custom creative space. A space big enough for me to write, paint, scrapbook: CREATE. Do you have a favourite scrap space? Send me your link!